This is a quirky and fascinating book, one of a kind. 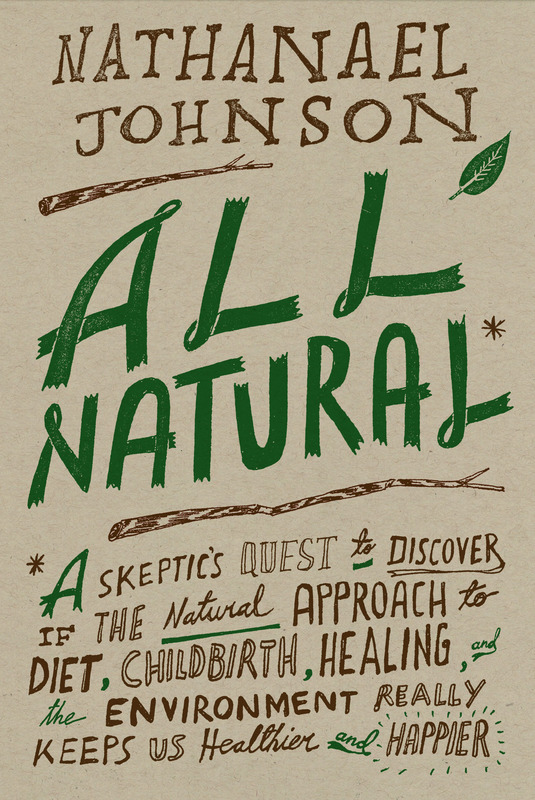 Johnson’s parents were stalwart hippies and raised him according to the orthodoxy that whatever is most natural is best, so: natural childbirth at home, no sugar in the diet, no clothing on the baby (not even diapers! ), natural medicines etc. Johnson decides to examine the scientific basis of these practices, and lo and behold, discovers more justification than you would expect for a radically less-industrialized approach to managing the various stages of development, life and death. I had so much fun reading All Natural that I found myself reading passages aloud to my husband and summarizing Johnson’s findings to my kids’ teenage friends. Nate Johnson puts on his skeptic’s unitard and wrestles with health-store logic resulting in a blend of reportage and memoir that’s hilarious, surprising, and downright interesting. There is a third way between knee-jerk technophilia and an uncritical embrace of all things labeled natural, and Johnson shows us how to find it: follow the research. The fascinating science he chronicles with clarity and grace shows that sometimes higher tech means higher risk and sometimes ‘all natural’ is neither good for us nor particularly natural. Like every parent, Nathanael Johnson worried about the right way to raise his child. He had been raised by parents dedicated to a “natural” lifestyle — should he do the same? But what is “natural”? Every time Johnson sought an answer, it squirted between his fingers. Luckily for readers, he wrote everything down. All Natural is the record of a sensible person trying to eff the ineffable, a guide to our increasingly irrational and artificial pursuit of the seemingly reasonable goal of a natural life. This guy can really write, and he can really report, and he can also really help you understand why some of the things you believe don’t make as much sense as you might imagine. It’s a book both gentle and wry. A highly readable journey, ostensibly initiated by the decisions he found himself facing when about to become a father for the first time…This book is an informative, valuable and engrossing read. 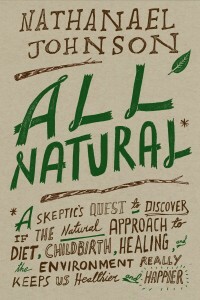 All Natural is a bracingly smart and witty inquiry into how, in the face of conflicting assumptions and evidence, we can ever decide the best way to go about doing things like having a baby or cooking dinner. Engaging, informative and heartfelt, “All Natural” gives voice and reason to the ecological anxiety and data ubiquity that permeate our culture. It’s hard not to smile when [Johnson] writes tenderly about growing up as a naked back-to-nature kid raised on zucchini in a world of space-pod juice packets like Capri Sun and spreadable cheese food. What’s really welcome about his deeply reported book, “All Natural,” is that his upbringing makes the investigation of nature versus technology fun as well as thought-provoking. A detailed, rigorous, and challenging read. Engaging look at the merits of nature versus technology… Johnson’s investigation is both horrifying and amusing, and readers will relish the colorful, witty writing and find much food for thought. [Johnson] presents a refreshing optimism that neither extolls the organic to the point of supporting pseudoscience nor negates the value of scientific advancements…the book strikes at the heart of hot-button issues with an Everyman appeal. [Michael] Pollan’s fans, as well as other readers grappling with the flood of conflicting information about how to live a healthy, nondestructive life, will appreciate this book’s thoughtful and nuanced attitude and its often surprising conclusions. San Francisco, California: January 31st in Conversation with Michael Pollan at the Ferry Building. San Francisco, California: West Coast Live, at the Ferry Building.